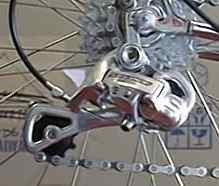 How to determine visually if you have the correct length of chain on a bicycle with derailleur gears. 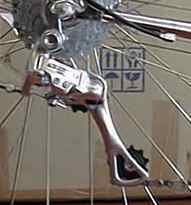 With the chain on the biggest chain ring (front gear cog or sprocket) and biggest rear cog: The chain tensioning arm of the rear gear change mechanism should be pulled fully forwards, or nearly fully forwards as shown. Remove one more link and the chain will be pulled so tight that it won't run freely through the jockey wheels. Now move the chain onto the smallest front and smallest rear cogs. The arm of the derailleur is almost fully retracted but still has some movement available to take up the extra slack that will form when the chain and sprockets start to get a bit worn. If your chain is loose on smallest/smallest, the best solution is to purchase a rear mech with a longer chain tensioning arm that can take up more slack. If you have horizontal dropouts you might be able to take up the slack by repositioning the back wheel. Alternatively remove a link and accept the fact that you will not be able to use your biggest/biggest gear cog combinations. Although it is recommended not to abuse your derailleur by using biggest front with biggest rear or smallest front with smallest rear there are circumstances where this might be unavoidable: Remember that when a front derailleur cable breaks, you get to ride home on your smallest chainring. If the rear cable breaks then you are stuck with the smallest rear cog. So if you don't carry spare cables and one breaks smallest/smallest is likely to get used regardless for the journey home.